A basilica as a ranking of a church is the more commonly used interpretation, rather than as the architectural style. The idea of ecclesiastical basilicas grew out of architectural basilicas. Because these early basilicas were built to be some of the largest churches around, as well as important gathering places for the community, they became the cathedrals for the local bishops, particularly as bishops gained more power in everyday life. This has evolved into bestowing the title of basilica on churches that are important to the spiritual and historical life of the church (hence why many basilicas are also cathedrals or shrines). As of 2010, there were 1,583 basilicas in the whole world. Perhaps this isn’t unexpected, but roughly a third of these are in Italy alone (good thing I don’t live there! I would never visit them all…). Basilica rankings can be broken down into two categories: major basilicas, and minor basilicas. There are four churches typically identified as the main major basilicas, all found in Rome: St. John Lateran (the cathedral of the Pope; also known as the Lateran Basilica), St. Peter’s Basilica (you’ve probably heard of this one; also known as the Vatican Basilica), St. Paul Outside the Walls (also known as the Ostian Basilica), and St. Mary Major (also known as the Liberian Basilica). There are a few others that have been elevated to this status over the years (like the Portiuncula), but the ones mentioned above are the canonical list. Minor basilicas are thus all basilicas that aren’t major basilicas. So, all the basilicas in the US are minor basilicas. As far as church rankings go, cathedrals are more important than minor basilicas, but the major basilicas outrank all other churches. But what does being a basilica garner? And how are basilicas chosen? When are they chosen? The Congregation for Divine Worship and the Discipline of the Sacraments is responsible for designating new basilicas. The process is lengthy at best, involving the church petitioning Rome for the title, approval of her bishop, and answering a questionnaire. Finally, they seem to be chosen whenever the Congregation has time to vote on it. Just looking at past announcements, they are announced at various times throughout the year. If you want a much more thorough explanation, the Catholic Liturgical Library has one. Aside from the title, new basilicas are granted the use of the umbraculum and the tintinnabulum. 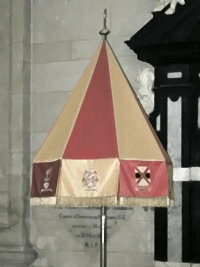 An umbraculum is an umbrella which is red and yellow silk for minor basilicas, and red and gold velvet for major basilicas. It’s placed near the altar, and is kept closed when the pope is not visiting. 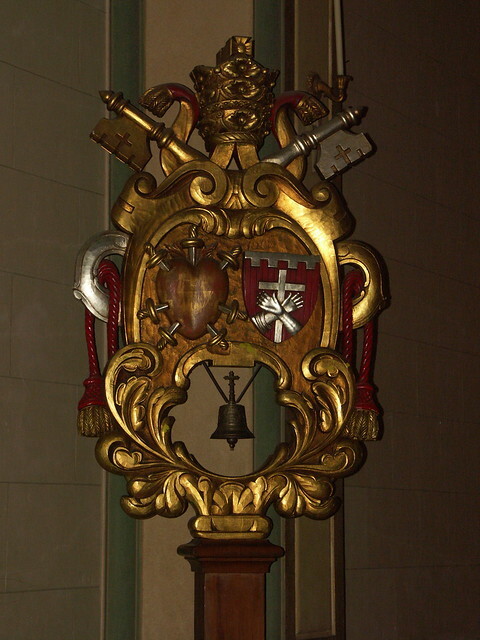 A tintinnabulum is a bell mounted on a pole, indicating the church’s ties to the Pope. Finally, the papal brief that bestows the title of basilica on the church is usually framed and posted somewhere. Aside from the physical benefits, the title of basilica signifies a certain amount of responsibility in terms of being a cultural center of the local church. For example, my archbishop in Milwaukee will be celebrating Pope John Paul II’s beatification at the Basilica of St. Josaphat, since the basilica is steeped in Polish culture. Although many basilicas are chosen because they are already spiritual hubs for pilgrimages, the title helps to increase their status in that regard. Hopefully these posts have provided some context for what it means for a church to be a basilica! Would you list the basilicas in the United States? Hi Janice! You can see almost all of them (minus the two or three most recent ones) just below the map here: https://hereisthechurch.wordpress.com/the-list/ Let me know if you have any questions on them!